Secretary of State Hillary Clinton met with other world leaders to discuss security and development in Yemen. London, England (CNN) -- Secretary of State Hillary Clinton on Wednesday pressed Yemen to implement key reforms as its government struggles to combat terrorism and shore up its faltering economy. Clinton met with representatives from other world powers Wednesday in London to discuss ways to help Yemen improve its economic situation and fight terrorism in the wake of a botched attack on a U.S. airliner. "Yemen's challenges are not going to be solved by military action alone," Clinton told foreign ministers from nearly two dozen Western and Arab countries, as well as representatives from the World Bank and the International Monetary Fund, according to prepared written remarks. "Progress against violent extremists and progress toward a better future for the Yemeni people... will also depend on fortifying development effort." The two-hour meeting, hastily convened on the sidelines of an international conference on Afghanistan, comes a month after the attempted bombing of a U.S. flight from Amsterdam, Netherlands, to Detroit, Michigan. The suspect in the failed attack, Umar Farouk AbdulMutallab, spent time in Yemen and is said to have acquired the device used in the foiled bombing from someone in that country. Al Qaeda in the Arabian Peninsula (AQAP) has claimed responsibility for the plot. The attempted attack highlighted the risk posed by Yemen to the United States and other Western nations. A potent cocktail of government corruption, water shortages and a decrease in oil income has contributed to fears that Yemen is on the verge of becoming a failed state. Wednesday's talks stressed the importance of economic development and strengthening the government's ability to deliver services to the people as critical actions in denying terrorists a safe haven in the country. One senior Clinton aide said the fact that President Obama asked her to skip his State of the Union address Wednesday night to attend the talks is a "clear indication" of how important Yemen is to his administration. "He asked her to continue to come to this conference, that it was more important for her to be here than at the State of the Union, which is atypical for the secretary of state not to be at the State of the Union," the aide said. The London, England, meeting also addressed ways to help the government control its borders and conduct more effective counterterrorism operations against AQAP. In recent weeks, Yemeni forces launched a crackdown against the al Qaeda affiliate in a series of attacks, and the government has tightened visa policies to prevent militants from entering the country. The Washington Post reported Wednesday that U.S. military and intelligence agencies have been involved in secret joint operations with Yemeni troops, killing six regional al Qaeda leaders in recent weeks. U.S. troops do not take part in the raids, but Yemeni officials have told CNN that Washington has helped Yemen with intelligence, training and weapons. Yemen is also facing a Shiite Muslim revolt in the north and a secessionist movement in the south. Clinton is expected to endorse calls for a cease-fire between Yemeni forces and Houthi rebels in the north. The participants at the Wednesday meeting weren't expected to pledge new funds, but discuss ways for Yemen to spend about $5 billion that was donated in 2006, most of which has not been touched. A "Friends of Yemen" group -- which will likely include G8 nations, Gulf Arab countries and other neighbors -- is expected to be launched at the meeting, to help the government identify aid priorities and deliver on promised reforms. The Yemeni government has blamed problems in implementing the reforms on the fact that several countries have not made good on their pledges. A senior State Department official traveling with Clinton said she will make the case for "shared responsibility." "Rather than making an accounting right now of where the blame lies, she would say let's have the donor community come together with a clear idea of the kind of contributions it can make and let's have the Yemeni government step up and actually implement reforms, many of which it's already committed to," the official said. Last week, after meeting with Yemen's foreign minister, Clinton said the United States would "intensify its cooperation with Yemen on both security and development." A recent agreement with the U.S. Agency for International Development will provide $121 million in development and economic assistance to the country. But, Clinton warned that that assistance "depends on Yemen's ability to make the tough choices necessary to improve the capacity to govern, to reform its economy, to protect human rights, to combat corruption and create a better environment for business and investment." Clinton will meet Wednesday evening with Afghan President Hamid Karzai before Thursday's 60-nation conference on stabilizing Afghanistan and transferring power from international forces to Afghan control. Those talks, also in London, are expected to focus on Karzai's plan to integrate members of the Taliban back into Afghan society and possibly even take part in the Afghan government. 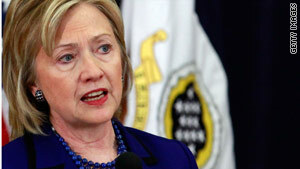 Clinton plans to also use her time in London to push ahead on imposing tough new international sanctions on Iran. A senior U.S. official traveling with the secretary of state said Clinton would discuss the prospect of United Nations Security Council sanctions against Tehran in talks with foreign ministers of Britain, France, Germany, Russia, China, Italy, Indonesia, Saudi Arabia, Turkey and the United Arab Emirates.